Welcome one and all to the next stop in the ZODIAC Blog Tour. Three cheers for Romina Russell. Hip hip...HOORAY! Hip hip...HOORAY! Hip hip...HOORAY! Romina is here today to talk about ZODIAC and things like her favorite book of 2014. There will be a giveaway, so keep an eye out for that. But first, here's Romina! 1. How did you come up with the idea for ZODIAC? My editor, Liz Tingue, and I came up with ZODIAC together—she brought her love of astrology, and I brought my passion for Space. We actually met ten years ago in a college class and have since been hoping for the chance to team up creatively—so I think ZODIAC was always in our stars. 2. Did you base any of the characters on people you know in your life? I didn’t! I’m not sure I know anyone who is a perfect representation of their Zodiac sign, so I had to craft new people who fit the parameters of this universe. 3. What is your sign, and what does it say about you? Do you believe it to be true? I’m from House Virgo, and we’re supposedly fussy, OCD, practical, analytical, controlling, perfectionists…basically, a bunch of words I’ve heard before…a few times…maybe. 4. What are you currently working on now? The sequel to ZODIAC! It’s so hard to keep quiet about what happens to Rho next…. Oh?!?!? *Ahem* You and I can just talk about that later. Let's continue. 5. What is your favorite book that you read in 2014? WINTER FALLS by Nicole Maggi, the first installment in a new paranormal trilogy. 6. In Twitter form (140 characters or less), tell everyone why they should read ZODIAC. ZODIAC is a Sci Fi series that's more Fi than Sci, featuring 13 made-up cultures, 11 futuristic technologies, 2 hot guys, and 1 fallible MC. If you haven't heard of ZODIAC yet, here's your chance! "At the dawn of time, there were 13 Houses in the Zodiac Galaxy. Now only 12 remain…. Embark on a dazzling journey with ZODIAC, the first novel in an epic sci-fi-meets-high-fantasy series set in a galaxy inspired by the astrological signs. " 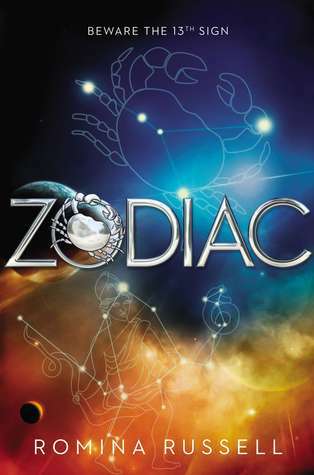 Thanks to the fabulous people at Penguin Random House, I am giving away a copy of ZODIAC to one very lucky winner. All you have to do is fill out the Rafflecopter form below. This giveaway is only open to US participants and ends December 28th. This is actually my favorite form of Sci-Fi. A sort of Social Sci-Fi the kind that Robert Heinlein and Ray Bradbury used to write. Thanks for the chance to win a copy of Zodiac. I love how this a expansion on an ancient piece of history that has influenced the ages! Also, it just sounds really cool and I have read great reviews of it! Thank you! I'm excited to read it because my best friend got me into astrology and I look forward to seeing it twisted. Astrology and Space.... Yes please! Different from a lot of YA books out there! I'm excited to read Zodiac because I have an interest in Zodiac signs. I am SO excited to read Zodiac! The premise sounds incredible, and unique, and I have heard so many great things about it! Thanks so much for the chance! Toon Games update new-best free Cartoon Games online from internet. Toon Games is a free online cartoon flash games site where you can find games from all your favorite cartoons such as Toon Games and many more. great post bro..i do like it!! informasi yang sangat bermanfaat dan luar biasa. Dan jika kalian berkenan silahkan kunjungi apk pro untuk mendapatkan game android secara lengkap dan terbaru.